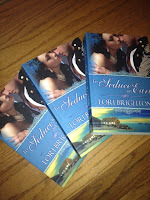 Last spring Amazon’s publishing branch Montlake purchased the rights for To Seduce an Earl and the two books that will follow. Today is the relaunch of To Seduce an Earl! “An original story line, well-developed characters, and a plot-full of …sexual intrigue…Fans of Johanna Lindsey will enjoy this work”– Library Journal. As Johanna Lindsey has always been a favorite, I was thrilled with this review! There will be two more books in the series, the second coming out sometime in the spring. For now I’m giving away 3 signed copies of the paperback! Just leave a comment. And if you’d like another chance to win, I’m giving away 3 more copies over at Magical Musings!